The Social Inclusion Research Fund (SIRF was started in 2005 on the initiative of civil society of Nepal and the Royal Norwegian Embassy in Kathmandu: Government of Nepal welcomed this initiative as highly relevant and endorsed the formation of SIRF Screening Committee represented by civil society, international scholars and government agencies. SNV Nepal was entrusted with the task of managing the fund, which has now a track record of having funded 303 individual researches and two major institutional research collaborations. The Social Inclusion Atlas Ethnographic Profile (SIA EP is a truly joint collaboration involving all key stakeholders. SIRF Secretariat and SIA EP management team have worked closely with staff in SNV, the Nor-wegian Embassy, Norad Oslo and Tribhuvan University departments taking full advantage of the resources that each partner have been able to bring into the project. SIRF Secretariat facilitated processes of research design, making a public call for proposal, and an independent review and award of this research. SIRF Screening Committee provided guidance in defining the strategic focus and priorities of SIA EP research. The SIA EP is a pioneer undertaking by the Central Department of Sociology Anthropology of Tribhuvan University, of institutional research involving a large team of multi-disciplinary team of academic researchers, policy makers, government agencies and civil society stake- holders. SIA EP management team earned this experience through hard work, determination and patience. The late arrival of Census data and the enormous pressure to complete the project in a given time-frame tested the crisis management capacity of the project. Prof Dr am Gurung managed the crisis efficiently and with team work, giving the team leaders full delegation to lead their respective teams. We are glad to have been collaborators in bringing forth the results of a very important undertaking. That the SIA EP has arrived at this stage of publication fills us with great happiness. We know that determination, positive outlook, team work and institutional collaboration in the face of challenges are a sure way to success. 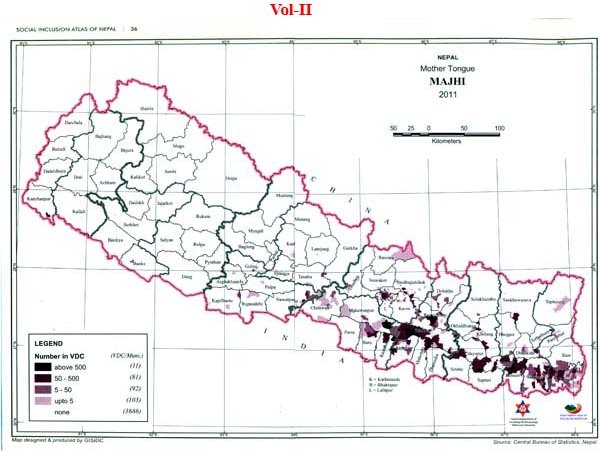 The publication of Social Inclusion Atlas of Nepal Series is extremely important to Nepali people, state and society. While reading through each Volume of Atlas it gives immense sense of having derived huge variety of information about the people of Nepal and gives a sense of belonging to a very wealthy nation. This sense if instilled in our young generation of students and leaders, can take us far on the way to peace and prosperity. The Atlas Series will be immensely useful to policy makers, advocates, educationists, practitioners and students to conduct their own analysis and further research. We are confident that this Atlas Series publication will help to a better understanding and development of our society, culture, history, tradition, economy as well as specific conditions of social inclusion and exclusion. We hope that government and donors will continue to give importance to evidence based knowledge and fund such research in future. The Social Inclusion Atlas of Nepal series presents spatial information about Nepal's ethnic, caste, and language groups along with other relevant social and economic data. 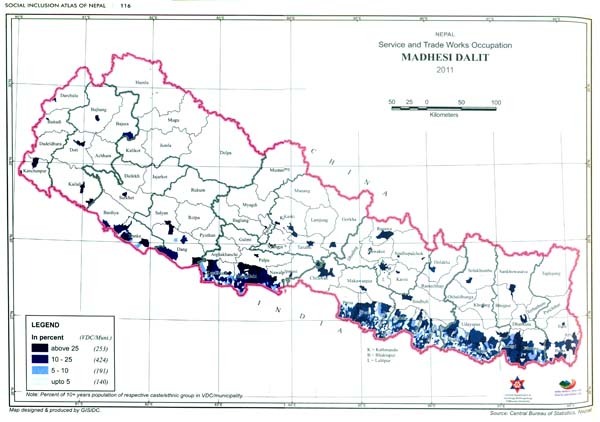 The primary purpose of the social inclusion atlas is to provide information about Nepal's social diversity and development status categorized by social group, and presented in the form of geographic maps so that it is easily accessible to decision-makers, planners, researchers, students and the general public. This Atlas series is one of the four components of the larger research project: Social Inclusion Atlas and Ethnographic Profile (SIA-EP undertaken by the Central Department of Sociology/Anthropology at Tribhuvan University. 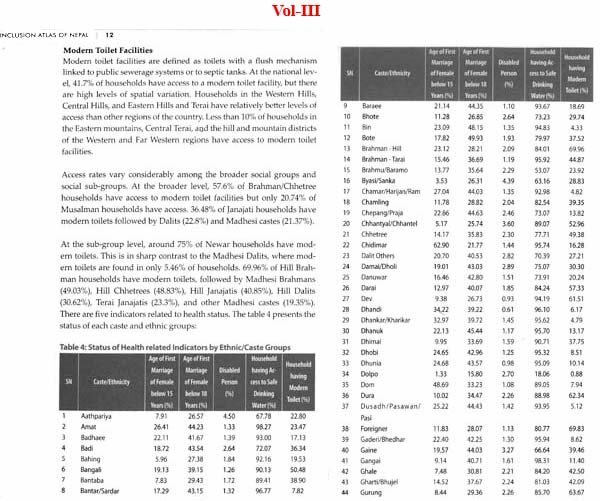 The other three interrelated components include the Nepal Social Inclusion Survey (NSIS, further analysis of national level data including the 2011 Census and Ethnographic Profiles of the 42 highly excluded communities. 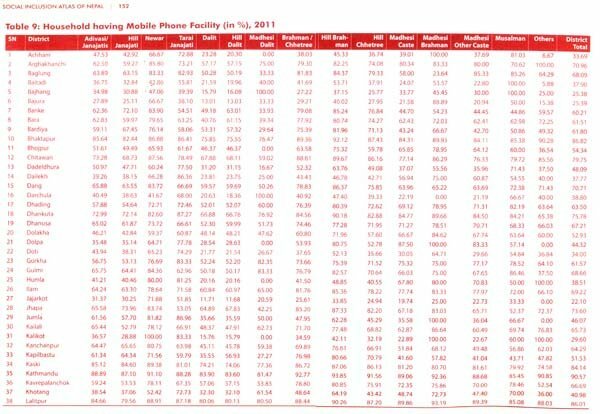 This latter provides qualitative rather than quantitative information. 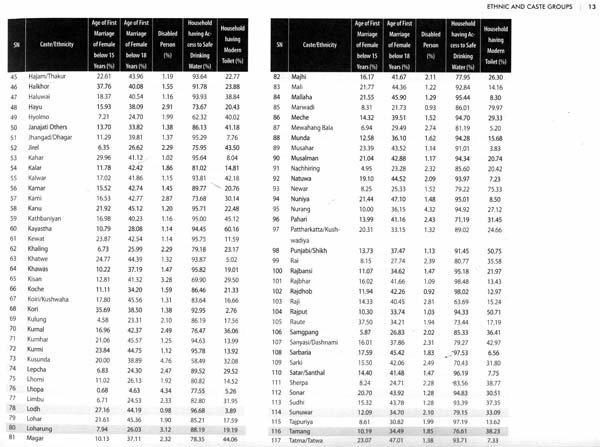 The overall objectives of the SIAEP research were to promote a more informed understanding of Nepal's social diversity by producing research-based, up to date information on the country's cultural and linguistic diversity and the status of social development among different caste and ethnic groups. The quantitative and qualitative information produced through research, is expected to contribute to policy design and research; it can also be used for educational purposes. The Social Inclusion Atlas of Nepal series has four volumes. 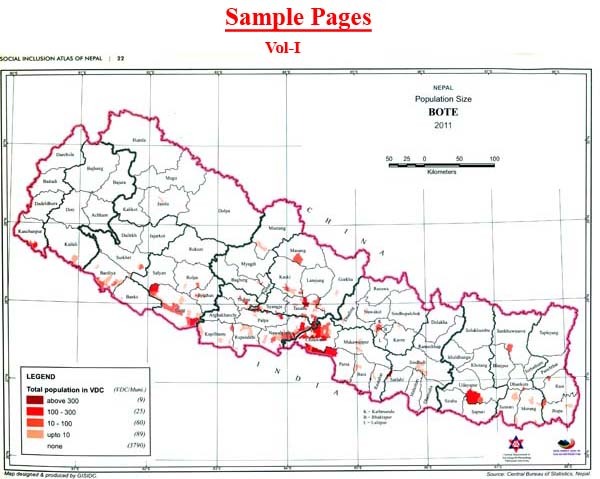 This is the first of the series, and presents information on the population of ethnic and caste groups in Nepal distributed across different Village Development Committees (VDCs and municipalities. The second volume is an atlas of the languages spoken in the country. The final two volumes provide information about a range of social and economic indicators. The third volume covers indicators on demography, health and education, while the fourth volume focuses on economic activity, and household amenities, among other topics. Maps were produced using GIS technology and with the data from the 2011 Census made available by the Central Bureau of Statistics. The successful completion of the SIA-EP research and the Social Inclusion Atlas of Nepal series was made possible with the generous support of a number of institutions, and with the effort of about 200 individuals. 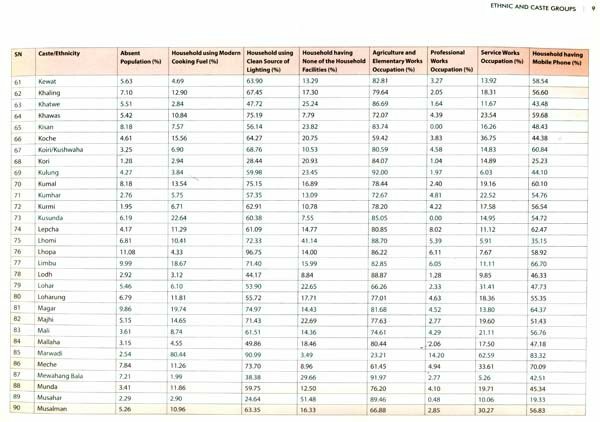 First and foremost, we would like to thank the National Planning Commission and the Central Bureau of Statistics for making available data on selected variables from the 2011 Census by VDC and by ethnic / caste group. 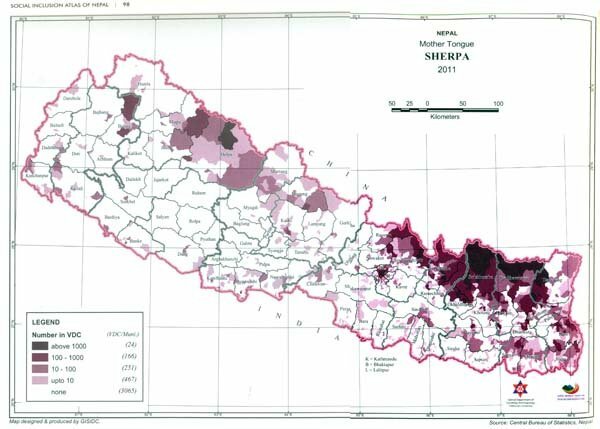 We would also like to extend our sincere thanks to the Department of Surveys for providing a spatial digital database of Nepal, and to the Central Department of Geography at Tribhuvan University for providing GIS software. We would like to express our gratitude to the Royal Norwegian Embassy (RNE in Nepal for providing the research funding through SIRF/SNV. We express our gratitude to Kristine H. Storholt and Lena Hasle from RNE for their valuable support and insightful feedback in accomplishing the task. We thank SIRF and SNV for managing the fund and Prof. Ganesh Man Gurung, Chair of the Screening Committee for supporting the research. Thanks also go to Prof. Shiva Kumar Rai, then member of the National Planning Commission, for chairing the Advisory Committee of SIA-EP Research. We would also like to thank Prof. Surya Lal Amatya, then Rector of Tribhuvan University, for giving permission to undertake the research project. Our heartfelt gratitude and special thanks go to Dr. Manju Thapa Tuladhar, Lead Advisor and Sita Rana Magar and team at SIRF Secretariat who provided invaluable support throughout the research work in many ways. We thank the team who worked tirelessly at Geographic Information System and Integrated Development Center (GISIDC to make this work possible. In addition to the cultural, ethnic, and ecological diversity found in the country, the linguistic diversity in Nepal is immense. Despite its relatively small size, Nepal accommodates multiple lan~ages and dialects with more than 123 languages enumerated in the 2011 Census. Such linguistic diversity not only enables multiple expressions of culture and creativity, but also helps to preserve biodiversity (Maffi 2005. Understanding, preserving and managing such linguistic diversity is an important issue for Nepal during the current period of democratic transition. Language is closely linked to issues of identity and human rights in Nepal. The language an individual speaks also has a major impact on his or her access to information and life opportunities. The Nepali language, which has been adopted as the official language of the country and promoted as such, is widely used. Despite the many justifications of the state's' one language' policy, it has had an adverse impact on linguistic diversity, with many of the country's minority languages suffering from truncated development or even the threat of extinction (Toba 1992. The loss of language has resulted in the erosion of a sense of cultural identity and self-esteem among many indigenous and minority language communities. Those who lack competence in Nepali and are unable to use their mother-tongue in the public arena face exclusion in a number of areas including access to education, information, economic opportunities, and social participation. Such a situation demands a language policy that views linguistic diversity as an asset rather than a threat to human wellbeing and that gives equal recognition and opportunity to all of the country's languages. In order to facilitate the process of understanding and approaching diversity, the Social Inclusion Atlas series aims to provide spatial data about Nepal's ethnic, caste, and language groups, along with other relevant social and economic information. The primary purpose of the Social Inclusion Atlas series is to provide information about Nepal's social diversity and development status, categorized by social group, and presented in a series of geographic maps so that it is easily accessible to decision-makers, planners, researchers, students and the general public. 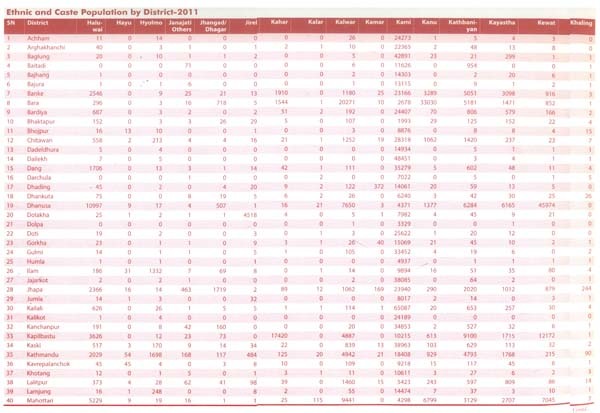 This volume presents the distribution of languages spoken in Nepal based on data from the 2011 Census. Languages reported as mother tongues are shown in map format by Village Development Committee (VDC and municipality. The detailed data for each VDC/municipality (together with a map is included in the attached DVD. 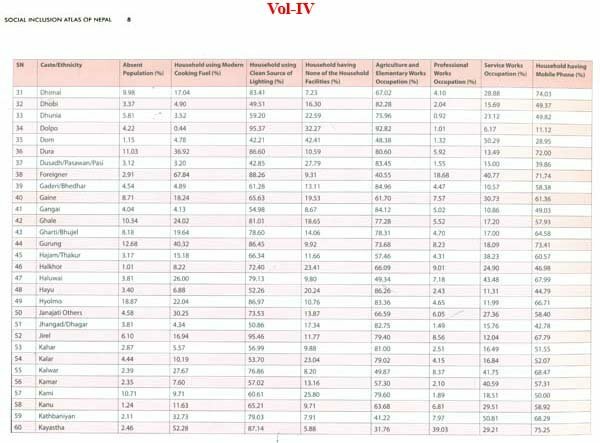 Like other volumes in this series, linguistic mapping was carried out using VDC/ municipality level data generated by 2011 census. A summary of district level data can be found in the Annex to this printed volume. THE LANGUAGES OF NEPAL The 2011 Census enumerated 30 new languages that did not appear in the 20m Census in which only 92 were reported (Gurung 2006. 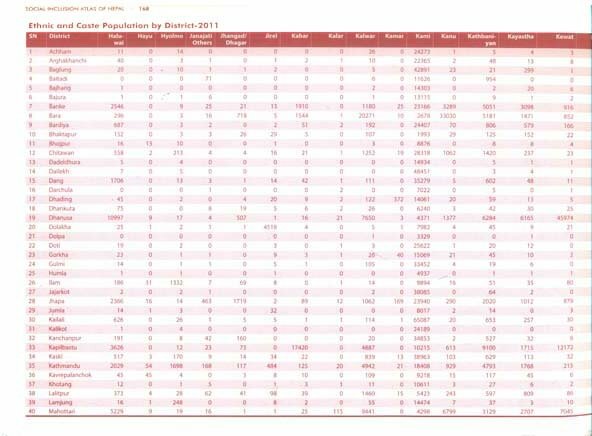 Nepal lacks comprehensive data on many of the languages spoken in the country; in addition there has not been a systematic study to explain the change in the number of languages reported in 2001 and 2011. The reported total seems to largely depend on the approach used to distinguishing languages from dialects. 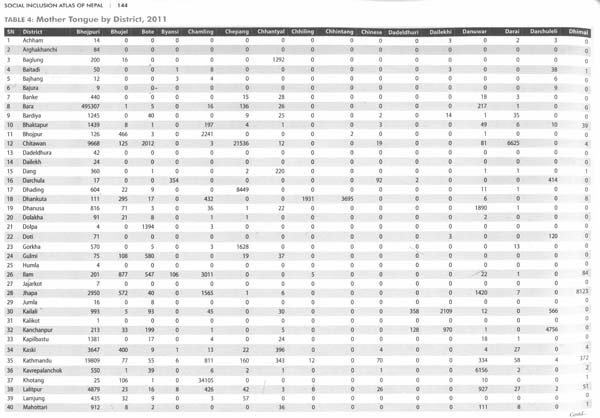 The Ethnologue catalogue of world languages lists 124 languages spoken in Nepal (Eppelle et al. 2012, similar to the number enumerated in the 2011 Census.